Pictured Above (photo credit: Becky Pearman) Sudden and myself with Errow and Jeremy. We had to use our smaller rig to jump the LQ batteries so that we could put out our slides on the LQ, oh what fun! When we were done with setting things up I went over to have Wes do some body work on me. Some soft tissue, near my hip has been really bugging me for a while now. Jeremy set up the crew area while I got started on the table with Wes. What Wes does is really incredible. You can feel things changing as he is working on you, all the while he seems to be doing very little. At one point he was doing something on top of my stomach and under my back, beneath my stomach (I was laying down on my back so imagine over and under me) and I could feel my stomach twisting and contorting. Very odd. After my session with Wes it was time for dinner, along with the ride meeting. It was a pasta feed. Lots of food, all very good. Then right into the meeting. I love it when things don't drag on, this was a nicely run meeting. All I had to remember was Yellow, Blue, Yellow... Or Yeah, Baby, Yeah. I always substitute the colors with words, it helps me remember and the more entertaining the better. After the meeting we loaded up Sudden and Errow and went home. It was much more fun to be at home to take a long shower and watch a few shows and hit my pillow. The next morning we were up at 5:30 and had our breakfast and coffee and then headed out into the wet grass, darkness to find our horses. Luckily they are both grey so it made it easier to see them. The "other" grey really wanted to go, Honor kept getting in our way. He is finally back to work after a year off and he thinks he is ready to go, gotta love him. Sudden and Errow ate their mash and we saddled them up. When they were done we loaded up and headed to the ride. The two of them ate hay at the trailer while we waited for the right time to bridle them for warming up. Merlin came with us so I took him from the commuter truck to the LQ. Sudden and Errow warmed up calmly, it was really nice to see that Sudden had improved so much from his last event. When it was time to go we mossied out and followed the controlled start. Within a few moments there was a big fuss up at the front of the ride. We were all riding through a huge grassy area and I looked out there and saw a grey mustang bucking and leaping across the green. He took many HUGE leaping bucks and finished with a full rear! The woman riding him stuck with him, and when he was done she didn't even ask to get off. Pretty great riding. The first loop was fun and our two horses behaved themselves. The lunch was really the best part if you ask Sudden. Errow and Sudden both enjoyed their food for the 50 min hold and then we were out on the Baby...er Blue loop. 20 miles. The yellow loop was supposed to be 15 miles and it was closer to 17 so we were hoping for a short loop. Nope, it was 20. That meant that this ride would be somewhere between 53-54 GPS miles. Bummer. The blue loop was fun. We went into the Hogs Pond loop but there was a really fun single track that we had never done before. Near the beginning of this loop Jeremy realized that Errow didn't like the saddle he was riding him in. It was a newer saddle from Argentina. I offered to trade saddles with him, giving him my Reactor Panel. Errow soon felt great again and the loop went fine. We made it in to camp and tried several things. It was the front left. After nothing worked we tried pulling off his Easy shoe, now he was worse! Oh boy. Hard to say if he was worse barefoot or worse from standing still. After 30 mins of messing with Sudden (who just wanted his hay) I went up to the vet and told him I was out. He checked Sudden metabolically and that was that. What a bummer for Sudden. It was later found that Sudden had an extremely sore back. The day after the ride he had a very hard knot on his left lower back, right where the back of the saddle would sit. I think that trading saddles for a 20 mile loop may have been my issue. Total bummer but the good news is that Sudden is fine now. Errow finished without an issue. Since it was still raining pretty darn hard and we saw the trail had a lot of rocks on it we were in a hurry to get home to put hind EasyShoes on the two mares that would do the LD the next day before it got dark. They only had Easy-shoes on up front and would need the hind ones for the trail that we had just seen. After the horses ate a little bit we loaded up our two, plus Jetta (who had finished the 50). At our house the herd greeted the horses back from the race. The three seemed happy to be back home in their own pasture to hang out in the rain, rather than being tied to the trailer at the race. 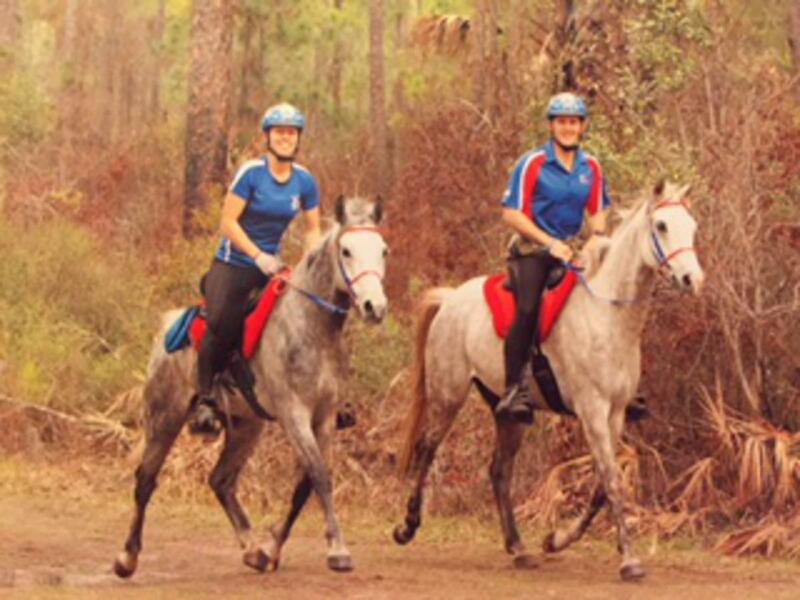 We caught the two mares for the Saturday ride to put their Easy Shoes on their hind feet. Deen and Treasure were the two. While we were doing them in our feed barn there was a tremendous down pour occuring on our tin roofed barn. If that wasn't enough to deafen you then the huge thunder claps were! Both mares stood very well considering! It was good to get back in the house and chill the heck out. We ate and showered and vegged out for a couple of hours before bed. Since we were doing the LD we got to get up a half an hour later. 6 am and we were up and at 'em. Breakfast and coffee. We had put the mares in our front yard paddock as Deen can be tricky to catch. The entire night it poured so hard it was unreal. There was also a lot of thunder and lightening. We fed the girls and loaded them up. When we arrived at the race we saddled them up and they ate hay at the trailer. (This is when I saw that Treasure had a notable swelling with a cut on her left forearm. That was weird, she didn't have it the night before when we were working on her.) I put Merlin in the LQ and it was time to get on. These two mares are super awesome. They are tremendous atheletes. Deen is a bit hotter, while Treasure has a really pleasant temperament while still being forward. We started right with the group for practice with group starts, both girls were very well behaved and trotted along perfectly nice. It was so great to see that they were adjusting so well to this sport from both running on the track this past summer. Neither mare was the least bit neurotic or jiggy, no wasted energy. The first loop was the yellow from the day before. The trail was entirely different than the day before however as it was mostly under water. SOOOO much water. Our mares won't have any trouble crossing water. The vet check was nice as the weather was almost starting to warm up, but I wasn't complaining, it was not raining! Our second loop was orange, also a water festival. The two mares finished and looked fresh. It was a really fun ride with them. After we packed up we pulled our commuter truck and trailer up to jump the batteries on the LQ once more to put the slides in and then we were homeward bound. Monday morning that LQ is going back in to the shop!! When we got back to our house we put the mares out and went in to the house to relax. After a couple of hours I went out to check on Sudden to see how he was doing (I didn't fully know it was just his back at this point as I had not seen the big knot until after I checked on him). I am so glad I went to go see him. It turns out that the front yard, paddock fence where the mares had spent the night had the big railroad tie, fence post (that is the anchor to the corner of the fence) fall down during the storm. The big cut with the swelling on Treasure's leg now made sense. Horses! We were so lucky that the mares didn't get really badly hung up. Today we booted the 4 we will be riding next weekend in SC at Broxton Bridge. Hope to see you there. We went to the race venue on Friday afternoon. We walked around briefly and then had lunch there. The venue was beautiful. The permanent vet check makes it very nice and established. The hold area is landscaped. You arrive off of the trail on a track with gaurdrails. You go through something that looks like a ticket window counter. There is a walkway/bridge to get from the one side of the venue to the other, above the ticket counter window/walk throughs (kind of like you are entering a castle). There are about 6 or so arrival walk throughs. There is also a tower on both sides of the bridge for the announcer to view the race from. The horse wears a GPS tracking system which is on a headstall that is put on by the vet staff when you vet in. It stays on for the whole event. This system is the system that registers your arrival time. When the horse passes through the arrival gate (ticket window) it registers to a computer system. Then you proceed across the cooling area. This is a wide area with many, many garbage cans full of water to cool the horses from. In this section, whoever designed it had great foresight. The whole ground is covered with rubber mats and there is a drainage system to recycle the water. If you have ever done mass crewing with a lot of water, you would appreciate the fact that you won't be in a swamp of crazy mud by the middle of the race. From the cooling area you proceed through another electronic time gate for your pulse. Once the horses crosses over that line your recovery time is recorded. Then the vet takes your heart rate with a hand held heart rate monitor and the pulse displays on a big digital read out so anyone watching can see the pulse. This area is very nice, green grass. Then you proceed to the trot out lanes, again being very nice green grass. You stand for vetting as usual and then, when ready, you trot down and back on the manicured grass lane for the vet. Because of all of the electronic read outs and timing you can go to a booth to get a print out of the race at any time and it will give you the stats on everyone in the race as far as placing, arrival time, pace, recovery time etc. Pretty cool. You can see where you are and how long your horse has been taking to recover at each check (as well as any one else in the race). After we ate lunch it was time for vetting to start. We watched all of the horses from North America vet in and then all of the European horses. The USA riders were Melody Blittersdorf and Willemina Deboer and myself. Jeremy and Ellen Olson had a horse there for the Guatemalans and Lori Schifflet had a horse there also for the Guatemalans. All of the horses vetted in. There were about 26 invited riders. 172 riders total would start. After the foreign horses vetted in then the UAE horses vetted. It was great to see Riverwatch again. He looked great. He vetted in perfectly. Then we had to go weigh in. There were 3 scales going and all 3 had live video, viewing the scale read outs to enforce correct weighing. I found it to be very cool that the race had orange weight pads for any riders not meeting the weight requirement. You would be weighed and then if you didn't hit the 75 kg then you would be given an orange pad with the added weight that you were short. The pads had a GPS in them as well, if the pad didn't go the whole trail you would be pulled. There was then a riders briefing that basically went over how their vet check flowed and some basic rules. We also found out that there would be prize money for all finishers and cars for the top ten and first 7 foreign riders! When we left the meeting the USA Embassy representative had her picture taken with Jeremy and I. After meeting with Anzac on what he wanted us to do and what time to meet him in the morning, we left the venue. By this time it was around 6 pm. We drove over to a restaurant that there was a dinner party at that night. We had packed our nicer clothes and got changed in the bathroom. It was pretty funny as a lot of riders went in looking like trail trash and came out all dressed up. I'm sure the restaurant owner was relieved. After we changed we went to put our clothes out in the car and on our way back there was a guy with a falcon so Holly and I stopped to hold it and get our pictures with it. Once inside of the restaurant all I kept hearing in my head was the song from Alladin, "Prince Allee, Fabulous he Allee Umbabwaa..." The open sky seating with all of the lights and rugs was beautiful. It was designed like an outdoor street bizarre. Very awesome. We sat with a lot of the USA rider group and had a great time. After dinner, Melody and her group went out and rode a camel. We decided to make the hour trek back to the hotel before the dinner show. The race was in the morning and I didn't feel like staying up that late. I fell asleep easily and before I knew it we were getting up. We got to the venue witout any issue. Riverwatch was walking around with his groom. He looked relaxed. When it was time, he was saddled up and I got on to check my stirrups and then got off again as we had a lot of time. All the while he was walked and I had a yummy tea, similar to a chai. Anzac also told us that the Chalet (right behind our crew bay there was a one bedroom chalet fully stocked with drinks, food and a hostess) was open for us to enjoy as well. The chalet also had a deck with lounge chairs on it facing our crew bay as well as a flat screen TV that had all of the electronic data being updated live for the race (this is where I could see things like my out time). Very cool. It was finally time to get on and ride Riverwatch around. I would be riding with a girl named Annette who was riding Run (he came in 9th at the WEG with a different rider) and Sheikh Abdulla. I went around a couple of times and then filed out to the start area. I lost Abdulla and Annette for a while and was looking for them in the crowd of 172 horses. Moments before the start I found them and we all rode off. The race was 5 loops. The first one being 25 miles! The footing was very sandy, from hoof deep to fetlock deep for the majority of the loop (about 60-70 miles were like this footing, so incredibly difficult). A short ways into the loop our crew started handing off water bottles. Riverwatch was scared of them (We had the same thing with him. I was actually practicing bottle hand offs 2 days before the World Championship in England and got dumped off of him!). He was scared of the bottles for a while, I started asking for the crew to toss them to me so I could get water on him. I was getting pretty wet but so was Riverwatch so it was ok. After a ways Riverwatch's groom started handing off the bottles. Then Riverwatch was immediately happy and not worried. It was very clear that he trusted his groom above all. The three horses finished the loop looking great and all vetted in fine. (Unfortunately I found out that Melody and the Olson's horse and Lori Schifflet's horses all vetted out after loop 1) The hold flew by and we were off again, this time I went a little slower as planned and Annette and I rode together while Abdulla went on ahead. The horses worked well and we got plenty of water bottle hand offs. This was another long loop, 22 miles. On loop 3 I rode the majority of the loop with various riders switching around. It was best to try to be in a group as the different crews would then rotate handing off bottles so that everyone got more. (It was here that I found out that Willemina had been pulled for metabolic). Loop 4 I rode with 3 riders most of the way around and I got a tremendous amount of water bottles, this was also a very warm loop. After this loop there was an exit exam. Riverwatch looked perfect. My final loop I rode alone. We did catch 1 horse halfway around the loop. Riverwatch was really proud of himself for this. As we were approaching the finish track a horse came up on us and Riverwatch decided that maybe he should try to speed up. I let him speed up a hair but as the other horse was really going for it I told Riverwatch that it was not a good idea and he agreed, the track is very long. We crossed the finish line in a time of 8:17 in 24th place, first foreign rider and first female (not that that was a big deal, we just happened to notice it in the results later and thought it was cool.) I believe that there were 8 foreign finishers of the 26 that started. There were 172 starters total and 72 finishers. Riverwatch vetted through perfectly. He has done around 9 FEI races, (4 100/160s and multiple 75/120s) since being in the UAE and he hasn't been pulled. Pretty awesome. After all was taken care of we left for our hotel for dinner and bed. It was hard to stay awake driving back. Dinner was wolfed down and shower and bed shortly followed...like the dead. The next morning my arms were sore in weird places from grabbing and pouring bottles. VERY sore:) We went to the Dubai vet hospital for Holly to make an Easyboot presentation and then went and met up with Juma and Maria for a visit. That was fun. Then we went over to Riverwatch's barn to have a look around and visit with Anzac. The horses that Abdulla has there that Anzac is caring for are beautiful. Anzac really loves them and that is very clear. Riverwatch looked great, he didn't lose any weight and he was moving great and looked bright and happy. After a nice long visit we went to lunch with Anzac and had fun conversations at a beautiful place over looking a golf course. There was a cat there that helped me eat my burger;) I slipped him the part I couldn't finish. It was late in the afternoon when we said our good byes. What a great time. We went back to the hotel and on our way we went to the falcon market. In this complex there were many stores with falcons for sale. There would be 20 or so in each "pet store" standing on perches. They were stunning. There was also a tack store in this complex so naturally we went shopping. Also there was a big area (I didn't go in so I can't describe it) to take your falcon flying. There was a group of men waiting to go fly their birds. Pretty fun. Seemed like a social hangout, much like a shooting range or bowling alley. When we got back to the hotel we relaxed for a bit. We were on the 1 am flight later that night/next day. Then we went down for dinner and then got a ride to the airport. At 1 am the flight sat for another :45 mins waiting for some passengers. Finally we took off. 14.5 hours later we landed. It then took :35 mins for our bags to show up in customs. By the time we got to our gate we had missed our flight by :10. It was now 8:15 am. The next flight, just after noon was totally full but we were put on standby. Now we all deplaned. After a couple of hours I asked what the real reason was and was told it was a mechanical issue. 4 hours later they had us back on the flight! United is really great, said no one... 39 hours after we took off we were at our house. By the time my head hit the pillow it had been over 48 hours since I was last horizontal. Good to be home. Yesterday afternoon we had the privelage of going to the barn where Ssamiam, now known as One-O-Six, lives. It is a beautiful stable with gardens all around. There are also many cats and birds on the grounds. The Pea hens were all pecking around in the grass, and the flowers were vibrant. Our friend Uma Mencia came and picked us up from our hotel to graciously tour us around. It was about a 10 min drive to the stable. This is one of Sheik Hammdan's stables. There were over 200 horses, if I had to guess. When we arrived there were horses and grooms all around. The amazing thing is that each horse has their own groom, who is their groom all the time, this gives the horse a stable person to count on and be very familiar with. The horses all loooked great. They were all at a very healthy weight and groomed to a shine, and this was not a special occasion, just a regular day. We went in to the barn that Sam was in and he looked like his usual self, he had a twinkle in his eye and a playful look about him. Uma let us take him out for a walk around the grounds where he could graze. It was pretty awesome as she was telling the people that we walked by that he was my horse. Sam had fun hanging out with us and grazing. He also was very quick to jog around when asked and he was springy and very sound. After picture taking and a little visit we took him back to his stall and toured the rest of the stable grounds. It is amazing seeing all of the tracks to train on and the pool for the horses and equipment at the facility. There is also a lake full of flamingos on the training track, pretty awesome. Sam is in a great place. He has been here since 2010 and is turning 14 this year. He looks well and his legs look clean. At the end of our visit we said hello to the trainer, Salem. We had a brief talk of the races that we would be watching that evening at the Meydan Racetrack. Salem had a few horses entered in the flat track races that night. I then told him that Sam had been a pretty decent race horse before endurance. He was a little surprised. Good 'ol Sam is full of surprises. He looks like someone's backyard pony and yet he was 4th across the line at the 2010 WEG (his second 100 miler) and he won over $42,000 on the race track. Such an amazing horse. When we got back to the hotel we got changed and headed over to the suite that we would be viewing the races from. Very fun evening. There was 1 Arabian race on the card followed by 6 Thoroughbred races. Bigg N Rich won the Arab race. We noticed that Bigg is very closely related to the horse Jeremy rode in France this summer at the WEG, Gold Dust Rising. After we had seen most of the races we decided to go back to our hotel restaurant for dinner. There is an outdoor eating area that we could still see the remaining races from as we ate. We sat with the other USA riders and had a fun time. Around 10 we went back to our room to wrap up our day. Friday we vet in and Saturday we race. I still don't have credentials so hopefully that gets resolved! I'm sure it will. Ok, now it is Friday. Jeremy keeps waking up WAY too early, so he went to the gym and for a swim this morning in the amazing pool on the 11th floor. The infinity edge of the pool, overlooking the race track, is a glass wall and glass floor so you can see through to the track and also see below you from the pool. We got Jeremy from the pool and had breakfast and now we are waiting to go visit with a farrier who shoes a lot of the race horses for Mike de Kock. My sister Holly is going to talk with him about the Easyboot products and we are going to tag along. After that we will head out to the race venue, which is about an hour drive from the hotel. Vetting in, weighing in and the ride meeting are all this afternoon. Melody Blittersdof and I are having some type of interveiw as we have been selected as the USA Embassadors. Then there is a dinner party out by the race venue. After that I am sure we will be heading straight back the hour drive to the hotel and going to bed for an early start tomorrow. We travelled all day yesterday, and even lost a day somewhere along the way. We left Orlando at 3:40 pm on the 6th and landed in Dubai at 7:40 pm on the 7th. When we reached Dulles, on our layover, we had dinner with Krista and Glen, who were both on their way to Dubai as well. My sister also landed there but was later so she ate a quick bite just before we all boarded the flight for the long haul, the 12 hour flight to Dubai. When we landed we got to skip to the front of the customs line and go straight to baggage claim. After that there were suppossed to be people with signs with our names on them to pick us up to take us to our hotel. There was one guy holding a sign and it was Glen's name on it! We all piled into his car, Canadian flag hanging and all! Very nice. Once we were at the hotel we all checked in and then regrouped about 30 mins later for a bite to eat. The group was Holly, Jeremy, Glen and myself, later joined by Emmett and Krista. Great food and fun conversation. We hit our pillows just before midnight. Our room is gorgeous. This morning we got up and stepped out onto our balcony to see the track horses doing their morning workouts on the track just below our room. Pretty awesome. We went down to breakfast and saw several others from the USA group. We decided to go to the Dubai Mall as there was a tour bus heading there and we didn't have a horse to care for. We had a great time looking at things and seeing the aquarium and various sites like the huge waterfall and the fountain. When we returned to the hotel it was time for the Meydan luncheon. We had another delicious meal and were also each given a swag bag with a hat, polo, jacket, gear bag and a trophy plaque. Pretty nice. This past weekend we did the Greenway Gallivant 2 day ride. It was really fun. The camp had changed locations from years past and with that there were entirely new trails. The best part was that we had an FEI ride in OUR town!!! Nicki and Andy came up, so it was fun to see them as well:) When they arrived we loaded up our four horses and drove over to the ride site, a whopping 25 mins. Part way over to the ride we got a text from a young rider who needed her horse's feet done. Jeremy got out of the truck and he and Andy doubled back to get the size Easy shoe that was needed for her horse while Nicki and I continued on. We got the four horses all settled. King and Rictik would do day 1 so they stood on one side of the trailer, while Sam and Fiddlin were doing day 2 and they were on the other side. After getting all of them hay and water I went and got the paperwork taken care of and then Jeremy was there and we vetted in King and Rictik. Nicki was going to ride Ellen Olson's horse, Scarlett on the 2* for day 1. I would ride King on the 2* and Rictik and Jeremy Reynolds would do the 1*. After vetting in and weighing in Andy, Jeremy and I went to grab a bite to eat while Nicki finished getting her things organized with the Olson team. We had a nice time with live music at the Blue Gator, always a good time. (Andy brought her back dinner.) We got back to camp to go to the ride meeting. The meeting was really lengthy... Oh well. I just wanted to go to bed but then someone mentioned the Rider ranking list... Crap. I hadn't renewed ours and we wanted the rides to count for our USA rankings. I tried to renew on my phone but it wasn't working so after the meeting I had the pleasure of driving back to our house to use my lap top to try renewing. I caught a ride back with Nicki and Andy and then I would drive our car back over to the race. After trying several times I emailed our endurance rep at the USEF saying that I give up and that I need to be on the rider ranking list but that the website wasn't letting me. I decided to shower since I was at home and wanted some benefit! While I was in the shower I got an answer from Kristin at USEF on how to access the rider ranking list. Not intuitive at all. Like the thing that actually says "rider ranking" is not how you get to it... Whatever, I got it done and went back to camp to go to bed. The next day I got up at 4am to feed the horses then went back to bed. For some reason the dogs were being extra "special" and kept wanting to go outside. I was not getting the sleep I wanted. When the alarm went off to get up I felt like I had been awake for a while. Frapicinno time!! The loops were 10 miles with a 15 min stop (no vetting, just relax and then 15 mins later continue) then a 15 mile loop with a 50 min hold, same 15 mile loop with a 50 min hold, same 15 mile loop with a 60 min hold, 10 mile loop (that we had done on the first loop) with a 30 min hold and then the same 10 miles to the finish. It wasn't as boring as that sounds. The 15 mile loop was really fun, it was a very twisty single track with lots of lateral work, with a few obstacles and mostly sandy footing (which got deeper and deeper), by the 3rd time through it was really eating at the horses. Nicki and I rode together for the first 2 loops and then on loop 3 we were just minutes apart but then her mount was a little off and that was the end of her day. By the 4th loop I caught up to Meg Sleeper. From that point on we rode together. It was fun, the trail was very pretty. The sunset was especially beautiful, the pink hues were ever changing until you could see a bright pink/red stripe on the horizon, all the while the frogs and crickets were singing along. Exquisite. At the end of the day King crossed the finish line in front. He was really great all day and was recovering amazingly. For the most part I was my own crew, (although Andy had brough ice and at one check he was there and at another check Jeremy was there, I appreciate both of them helping me). It was pretty hot and humid as well. I really think King is going to be a good one. He trotted for BC looking snappy, even though he was scared of the flood lights in the vetting area and wouldn't really do a proper circle because of it! Rictik did great as well, she finished her 1* and came in 11th, looking fabulous. After we took care of both of the horses we went to dinner with Nicki and Andy at Don Pepes, our local Mexican restaurant. It was really fun, then back to the ride for bed. This night Merlin wasn't feeling too well, he was moaning as he fell asleep. His belly was bloated too, poor guy ate something that he shouldn't have. Another poor night of sleep and then it was time to get up. It was notably warmer. We started our 1* at 8 am on Fiddlin and Sam. The 10 mile loop was uneventful followed by our 15 min stop. The 15 mile loop was much deeper than the day before and it was warmer and much more humid. Poor Fiddlin (the unicorn) was very hot and having trouble recovering, we did all we could but he did not make the 20 min FEI recovery time. Totally odd, he has never had an issue with recovering. We later thought it may have been due to a low grade sinus infection from his recent accident. 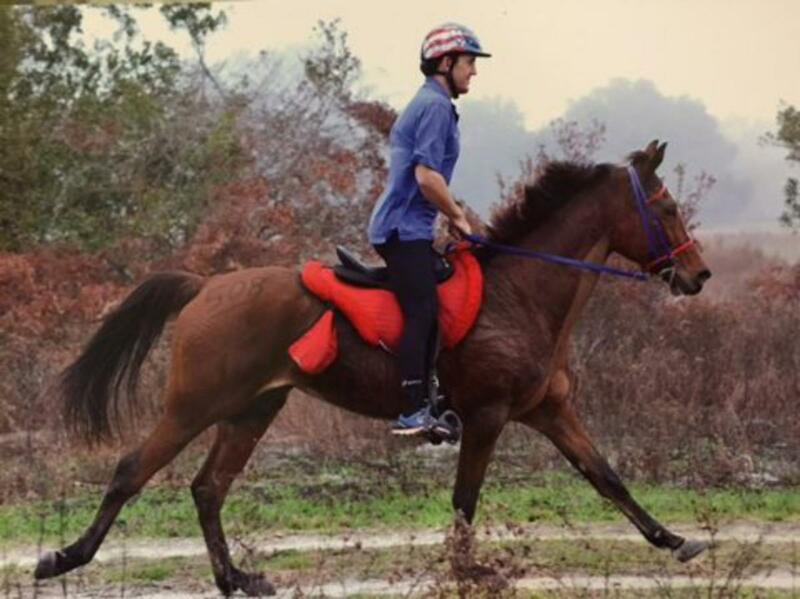 He was pulled from the FEI ride but was able to continue with the AERC ride. At the lunch hold Merlin had thrown up an impressive amount of "things" for a dog of his size! He seemed to feel much better though, so who cares? The day continued on and Sam and Fiddlin both finished the AERC ride and Sam got his 1* as well. Overall, a super sticky day in the deep sand. We cleaned up and after a few hours we headed home. The horses were really happy to be out in their pasture. We were really happy to be showered and relaxing in our air conditioned house! We slept 11 hours that night:) Back to human. Today is Monday and we ran a bunch more errands, we leave for Dubai tomorrow!!! Yay! My sister Holly, Jeremy and I all fly tomorrow and meet at the Meydan Hotel tomorrow night. I can't wait, I'm so excited to visit with our friends from the UAE. I will try to keep up a blog while we are over there. The race is on Jan 10th and we return home on the 12th of Jan.